Thursday, 7 February 2019, 5:13p.m. A real estate agent has been left red-faced after making an awkward typo in a property advertisement that could damage the homeowner's chances of selling. While many might think the ad for the two-bedroom Melbourne home for sale might seem normal, a closer inspection could leave potential buyers scratching their heads. 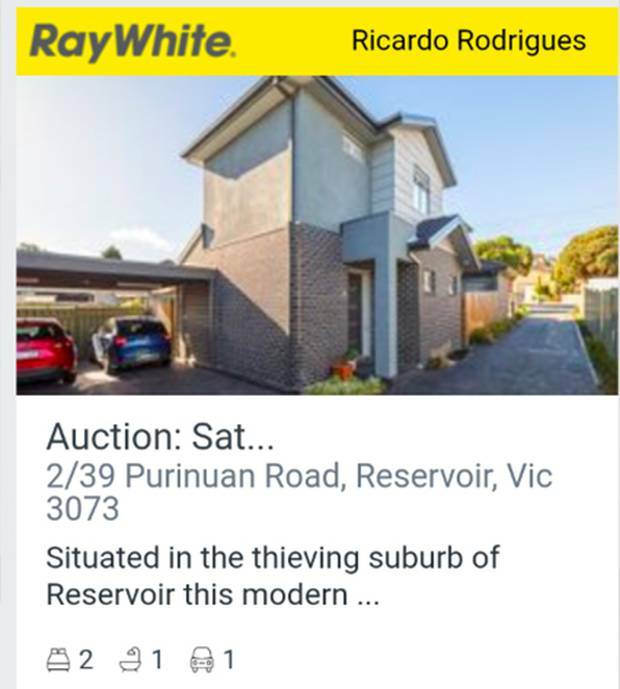 The Ray White ad was advertising a home in the Reservoir, but they described the property as "situated in the thieving suburb" instead of "thriving". "Situated in the thieving suburb of Reservoir this modern double storey townhouse boasting relaxed, easy living is on offer to you," the Ray White ad said. The typo has since been fixed but the stuff up may have left viewers second-guessing whether Reservoir is a safe neighbourhood or not. According to Victoria's Crime Statistics Agency, the region of Darebin (where Reservoir is located) had more than 5300 thefts in 2018 while the city had more than 1300 burglary and break-ins. The theft rate of Darebin is double that of neighbouring area Banyule. Viewers have flocked to social media to poke fun at the situation, with many saying the real estate agent was just being honest. "It doesn't seem like a typo to me. Seems like the agent was just being honest," one person wrote. Some joked the agent now has free advertising while others said the moral of the story was to not rush your ads. The home will be auctioned on March 2.